I love gathering with our extended family who have always been a close-knit group. Whichever family member is hosting Christmas in any given year has only to provide some of the food. We each bring our favorites to contribute to the meal. That way no one family is burdened with doing everything themselves. But even with all this seasonal joy I find myself falling into a dark funk sometimes. Maybe you do too? Last Christmas was an emotional challenge for me for some reason. Over the years I’ve been able to successfully pull away from the mad, crazy consumerist portion of the holiday. I thought that would solve a lot of holiday emotional frustration for me. I think I have visions of perfection at Christmas and, well, we don’t live in a perfect world. Of course I’d love to gather all of our children (and our grandchildren) under one roof and celebrate a good old-fashioned Christmas as a family like we used to. But that doesn’t often happen. The kids all live in Texas but they have other family members and oftentimes inlaws as well with whom to balance their holiday time. I totally get that. But some years I still fall into a pity party feeling sometimes that RancherMan & I don’t receive the same presence that others might receive from our kids. I realize they’d have to travel between 1.5 – 2 hrs to spend Christmas with us and the rest of the family, maybe that’s just too far for them to want to drive? Maybe they just don’t have the available time during the holidays? I guess I get my feelings hurt sometimes, but this is something I’m working on. I’ve got to learn to accept that Christmas is not always my version of perfection. That it will not always look like a Norman Rockwell image. And I need to surround myself with those real blessings in my daily life that lift my spirit instead of looking at what I feel might be missing during the holidays. 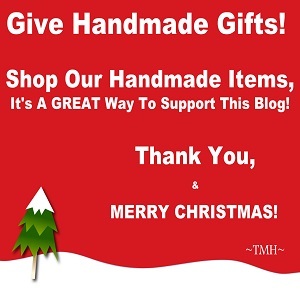 Gifts – Purchased Or Handmade? So RancherMan & I decided long ago to make our gifts handmade each year. Although they’re much more time intensive, we feel they’re also more personal – a gift from our hearts. We prefer consumable gifts since it’s pretty much a one-size-fits-all satisfaction gift. We’ve given homemade soap, beeswax lip balm, vanilla-infused honey, homemade hummingbird feeders with homemade hummingbird nectar mix, home-canned delights, etc. Yes this alleviates the Christmas shopping push-n-shove, but making your gifts takes much more of your time and sometimes even more of your money than just buying the gifts and being done with it. Sometimes these homemade gifts stress me out because I worry about all the same stuff that I did when I was just buying them from the store. Will they appreciate this? Is it worth the time & effort we’re putting into it? This second-guessing myself is also something I’m working on. Here’s where the struggle gets real, y’all! Mama always says ‘Presentation Is Half The Gift’ so I always fuss majorly with the actual gift presentation. Enough to make RancherMan pull his hair out each & every year! For instance, last year for Christmas we made the kids a jar of vanilla bean infused honey from our hives, some honey-sticks to sweeten their tea, and some homemade beeswax lip balm. Each of these gifts took lots of time from harvesting the honey, purifying the wax, making the gifts, etc. But I didn’t want to just plop it all in a crumpled paper sack and hand it to them. I wanted the gift presentation to pop! Of course I decorated the honey jar, but how do I present the bundle of our homemade gifts? I decided to sew a denim gift bag for them, which didn’t take too long I guess. But then I stressed about them all looking the same. I decided to embellish each denim gift bag differently. 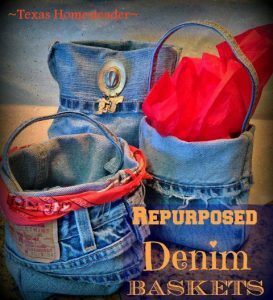 So I cut strips of denim & hot-glued them into ribbons or other embellishments on front of the baskets. But what about the stuffing? I’d like this gift bag to display the gifts we worked so hard on. So I took the brown-paper section of our cattle feed bags and crinkled it and cut it into strips. LOTS of strips! Those strips were fluffed into the baskets to hold the lip balm tubs up higher. That way they wouldn’t just get lost in the basket. The honey sticks were tied together but I decided it didn’t pop enough. So I took the bundles apart, cut thin strips of denim and tied them with that instead. A printed card describing the gift aspects was placed in the baskets and we bought a honeybee stamp. I even made the ink for the stamp myself using charcoal tablets and water. Then I stressed about how to ‘package’ the lip balms. First I tried this, then that – it was enough to drive RancherMan crazy. It took days & days (and a HUGE mess) to just to complete those 4 gift baskets. And that was AFTER all the gift items had been made! So yeah, the gifts popped to my satisfaction, but at what cost? Does all that work garner more than a cursory glance from the gift recipients? Would they even have any idea how much time & effort went into that one small part of their gift? Probably not. Time to Take A Breath – Perfection Is Not Necessary! Do you find yourself in a funk this time of year? What do you do to try to alleviate that? 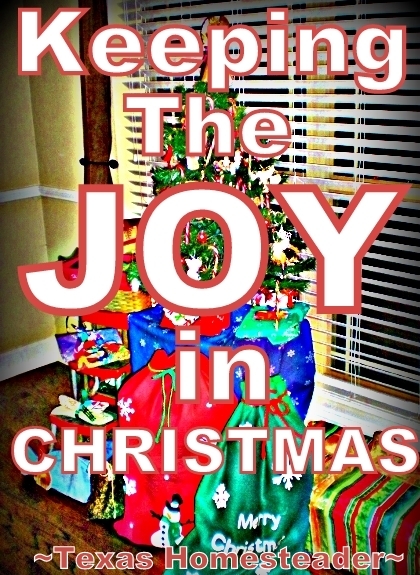 How do you keep the joy in your holiday? Eco-Friendly Gifts Your Friends Will LOVE! If you want to give handmade items this year but just don’t have time to make them yourself, I’d be honored if you’d check out our Online Store. It’s a great way to support this blog. Thank you! This entry was posted in Blog Posts and tagged Christmas, Holidays on December 10, 2017 by Texas Homesteader. I have always loved Christmas, and still do, but it is also the hardest season for me. Our only son cut himself out of our lives a few years ago and refuses contact, so I have many bouts of sadness when everything is supposed to be happy and joyful. And my husband and I live and work in different states, so it’s a lonely time as well. We have many blessings, and we will be together for the actual holiday, but the season before is tough. I get through it by praying a lot, and immersing myself in as many of the other trappings as I can – viewing light displays (lots of beautiful ones here in the Texas hill country! ), free concerts, church services, and of course the classic movies like Christmas Carol (Alistair Sim’s version is the best! ), White Christmas, It’s a Wonderful Life, and Charlie Brown Christmas. If spending all that time and effort doesn’t make you happy, then it isn’t worth doing. If simple leaves you feeling incomplete, then it’s worth the effort, regardless of the recipient’s response. Wrapping should be fun. Christmas is hard. All the expectations hit with a reality we wish wasn’t there. When dysfunction is the normal but we want so badly to be that family in the Hallmark movie. I understand exactly how you feel. It’s a struggle every year. This is how I feel. Like something is missing. I am really having to push myself this year to get things done. I use to be one of those people who had all presents purchased and wrapped by Thanksgiving and Thanksgiving weekend I would make Christmas cookies and freeze them. But not now. Yesterday, we had snow and I played in the snow with the grandkids and that boosted my mood. They are so excited about Christmas, its catching! Good luck on your Christmas gathering. Merry Christmas to ALL!